Where do I find a list of camps and classes? For a full list of camps and classes with detailed descriptions, take a look at our Program & Event Guide. For a list of youth camps and dates, visit our Youth Camps page. Visit our Adult Class page for a list of adult classes and dates. Registration for youth camps and adult classes opens each year on February 1st at noon, PST. How do I register for a camp or class? Explore class options and details using SSP’s online registration system. Yes! Please apply for one if you have any reservations about the cost of any of our classes. Scholarships can be given out for all classes and are appropriate for a wide variety of situations. Check out the Scholarships page for more information and the application. Do I need to know how to swim to take a camp or class? We ask that at a minimum, all participants must be comfortable in the water. 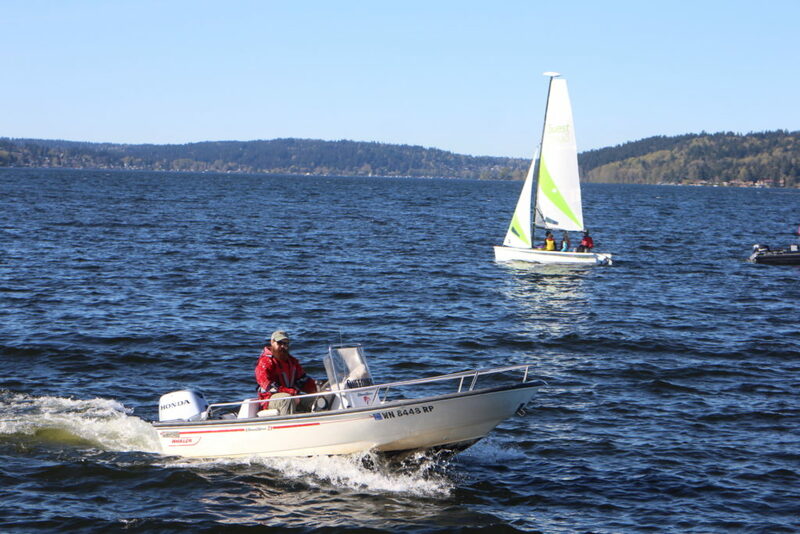 Sail Sand Point requires that all participants wear a lifejacket while on the water at all times. Youth Camp participants participate in a swim check on the first day, Adult Class participants do not. Do you have classes that are just for women and girls? We have several classes for adults and youth who identify as female! 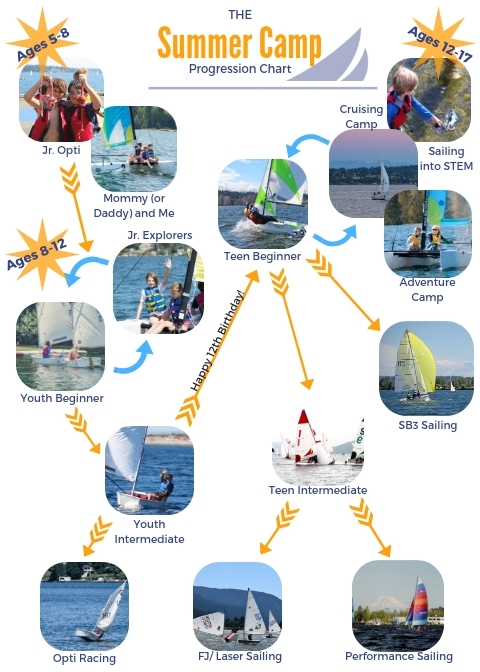 Our offerings are: Sailing into STEM, August 12 – 16, Teen Beginner August 5 – 9, Adult 101 May 28 – June 6 and July 13 – 21, Adult 102 July 27 – Aug 4 and June 11 – 20, as well as Intro to Racing June 29 – July 6. Which adult sailing class should I take? Class descriptions are available on our Adult Sailing page and visit our Program & Event Guide for more details. 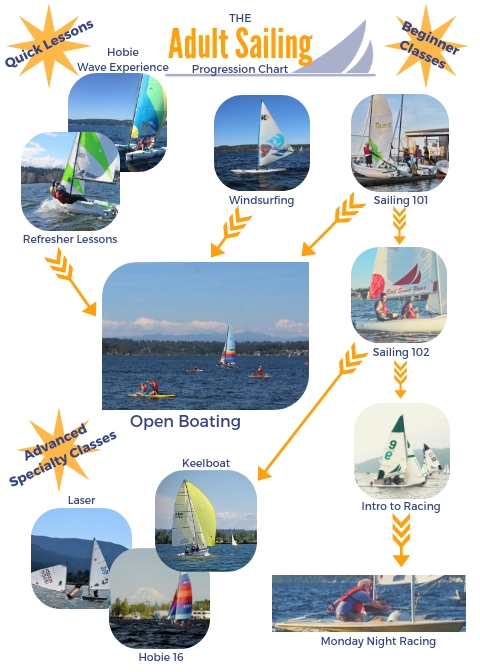 You can also refer to our Adult Sailing Progression Chart to know which class to take next. Which sailing class should my child take? Class placement for youth is important and greatly depends on age, weight, and ability/experience. In order for your child to get the most out of their time at Sail Sand Point, it is important that they are well-suited to the skill-level of the camp. Because of this, our beginner camps are repeatable, particularly if it’s been a year since your child’s last time in a sailboat. If you are sure your child is ready to move to the next level, take a look at our Summer Camp Progression Chart to know what to sign up for next. You can also visit our Youth Camps page and our Program & Event Guide for more detailed descriptions. Have a kid who loves to do it all? Our Junior Explorers and Adventure Camps are great options for kids who want to mix it up during camp and try a few different activities. Both camps incorporate sailing, kayaking and stand-up paddle boarding. Would your child enjoy learning to sail with a science perspective? Sailing into STEM combines sailing with science and discovery. This camp is targeted to kids ages 12-15. Please visit our Cancellation & Transfer Policy for more information. Please contact the office at 206-525-8782 for help with cancellations or transfers.